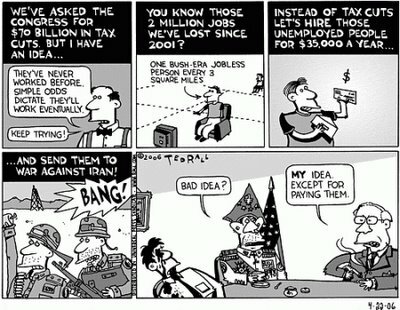 Eidelblog: How many lies can Ted Rall make in one cartoon? The only thing progressive liberals are progressive about is the tax rates and the only thing they are liberal about is spending your tax dollars. They are nice words to mask their totalitarian proclivities. I find it ironic that the vast majority of the leftist agenda is actually unconstitutional while the armed forces, which are constitutional, earn their ridicule and scorn. “Our true choice is not between tax reduction, on the one hand, and the avoidance of large Federal deficits on the other. It is increasingly clear that no matter what party is in power, so long as our national security needs keep rising, an economy hampered by restrictive tax rates will never produce enough revenues to balance our budget just as it will never produce enough jobs or enough profits. Surely the lesson of the last decade is that budget deficits are not caused by wild-eyed spenders but by slow economic growth and periodic recessions and any new recession would break all deficit records. In short, it is a paradoxical truth that tax rates are too high today and tax revenues are too low and the soundest way to raise the revenues in the long run is to cut the rates now.” JFK speech to Economic Club of New York, December 14, 1962. Fact, history, logic, or reason never get in the way of the leftist agenda to return us to thralldom. My bad. I meant amendment XVI. Dyslexia strikes again.